Found 12 file extension associations related to AppleScript Editor and 12 file formats developed specifically for use with AppleScript Editor. AppleScript Editor application is a native part of Apple's Mac OS X operating system. AppleScript is a scripting language that makes possible direct control of scriptable applications and of many parts of the Mac OS. 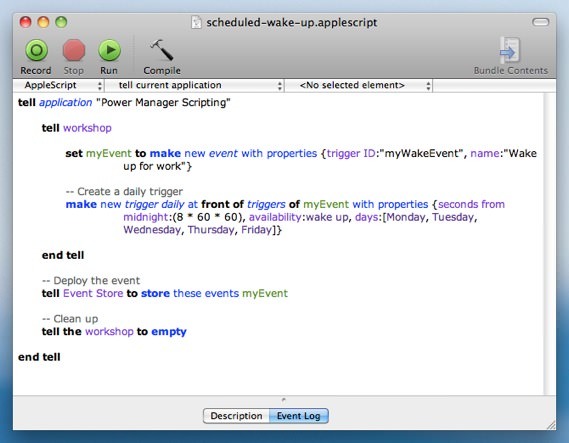 A scriptable application is one that makes its operations and data available in response to AppleScript messages, called Apple events. With scriptable applications, users can write scripts to automate operations, while developers can use AppleScript as an aid to rapid prototyping and automated testing. Developers can also use technologies including Apple events, AppleScript, Automator, and Scripting Bridge, to take advantage of services provided by other applications and by the Mac OS. AppleScript and Apple events are based on the Open Scripting Architecture, which is implemented by several Mac OS X frameworks. Apple provides a number of additional applications and technologies that enhance AppleScript or take advantage of its features. If you need more information please contact the developers of AppleScript Editor (Apple, Inc.), or check out their product website.